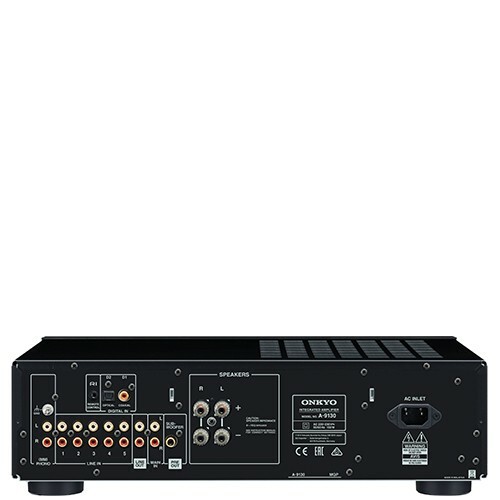 The A-9130 is a robust and versatile pre-main amplifier with wide connectivity and deeply enjoyable sound quality. In pursuit of musicality and fidelity to the source, the amp is tuned for warm, lively sound that expresses the tonal colors of your best-loved albums. Stable high-current power delivers accurate and agile sound across a wide and dimensionally realistic soundstage. WRAT (Wide Range Amplification Technology) was fine-tuned specifically for the A-9130 by Onkyo’s master technicians. Two 10,000 μF main audio capacitors were custom-made following exhaustive listening tests to realize a richness and dynamism that’s very easy to love. Make the A-9130 the heart of your home hi-fi and enjoy the musical refinement expected of a far more expensive component. Dynamic changes in music cause impedance to fluctuate, placing huge loads on the amp. If it can’t meet power demands, sound breaks up. 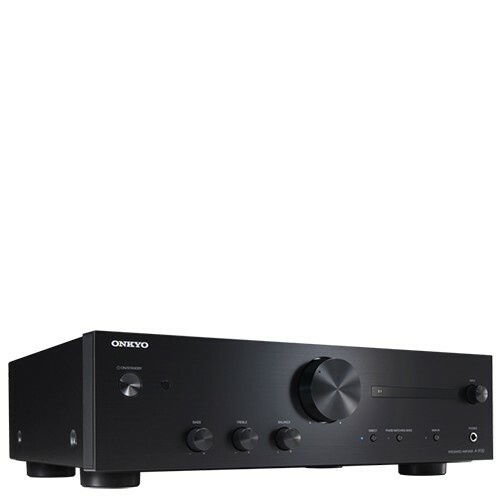 Onkyo’s WRAT employs a high-output EI transformer, 10,000 µF customized audio capacitors, and a low-impedance drive. As well as achieving more involving and musical sound, low-negative-feedback amplifier circuits with discrete transistors deliver deep and punchy bass thanks to wide frequency response covering 10 Hz–100 kHz. Digital sources are decoded by a premium Wolfson WM8718 DAC on the A-9130’s digital audio board. This D/A converter is frequently installed on top-shelf audio components thanks to exceedingly good performance and supports 192 kHz/24-bit audio playback. TOSLINK or coaxial digital audio inputs are also ready to amp your TV entertainment, bringing powerful hi-fi sound to movies, games, sporting events, and live concerts. When an analog input signal is detected, the digital audio board shuts down automatically to reduce potential interference on the signal. Most pre-main amps have a loudness button designed to boost low-mid frequency sound. However, conventional designs are prone to phase-shift, which degrades the clarity of the vocal frequency band. 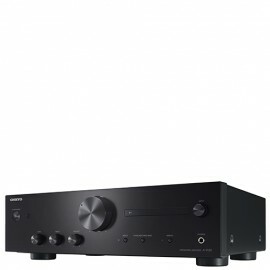 Onkyo’s Phase Matching Bass Boost function eliminates phase-shift between low- and mid-range frequency bands above 300 Hz. Bass response is enhanced without compromising vocal clarity, and that’s something especially useful when playing music at low volume where bass and high-frequency sounds are more difficult to hear. Direct Mode bypasses tone and PM Bass circuitries. In combination with a refined amp circuit design, signal-path-lengths have been significantly reduced in comparison to the A-9030 for even more accurate and faithful sound. Enjoy end-to-end analog music reproduction from turntable to speakers, and recapture the atmosphere of the original recording with any connected source. When playing music at low volume, the signal normally drops close to the component’s noise floor. The signal picks up noise, which is amplified, and the result is muffled sound. To avoid this, the A-9130 features Optimum Gain Volume Circuitry, which attenuates the signal by less than half the usual amount. The signal never approaches the noise floor so you can enjoy clearest sound at low volume. Every hi-fi component generates electromechanical resonance. This vibration translates into signal noise, and that impacts on the sound coming out of your speakers. To combat the negative effects of vibration, the A-9130 features a rigid chassis that’s fabricated from 1.6 mm-thick steel. Working together with large, wide-spaced insulators, unwanted resonance is virtually eliminated. A new display panel boasts fine text resolution, making it easier to read at a distance than single bulbs. It shows active selected input at a glance. Speaker cables with your choice of terminal are firmly secured by high-quality speaker binding posts. Each wide-spaced non-magnetic post prevents interference and features a large, easy-to-grip transparent knob.